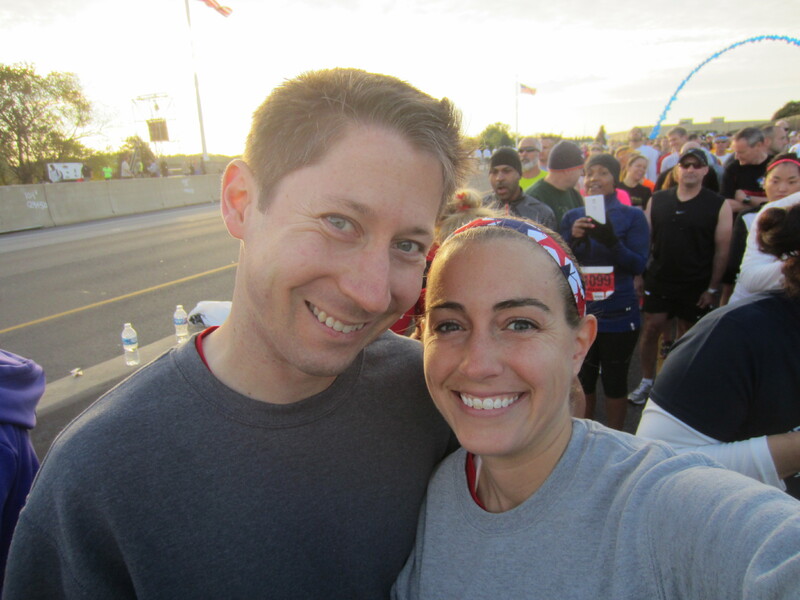 Last Sunday I ran my last major race of 2014: the Army Ten Miler. This was my second ten miler (my first being the Cherry Blossom Ten Mile Run back in April), and after a great summer of training for Rock ‘n’ Roll Virginia Beach, followed by a couple intense weeks of training this fall, I knew that I was capable of crushing my Cherry Blossom PR, which I did. But it didn’t come easily. 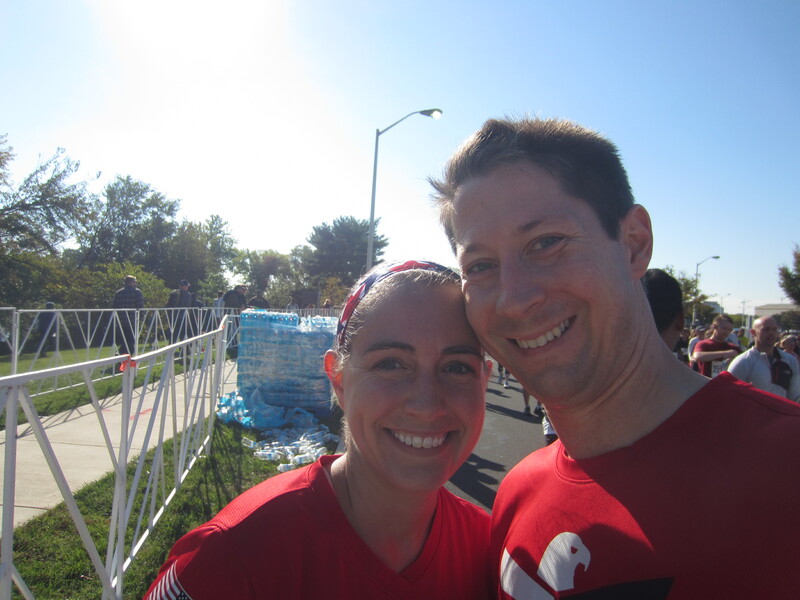 After reading several race recaps from last year and reading about the Metro crowds and the start area crowds, I knew that Preston and I needed to get to the Pentagon very early. We debated driving vs. Metroing, and ultimately decided to drive. We’re so thankful that we did, and when we arrived at 6:30 a.m. had no trouble finding parking in the Pentagon City Mall parking garage. We hung out in the car for a bit to keep warm, and then eventually made our way towards the staging area. We met up with Team RWB for a pre race photo, and received last minute words of encouragement from our chapter’s captain. After the photo, we made our way towards the start line. Unfortunately, it was getting close to the start time of the race, and by the time we tried to get to our corral (the Red Wave, which was the third corral), we found that we had to weave through the Blue Corral in order to do so. There wasn’t a clear walkway, and we wound up having to climb over a stone wall, which resulted in my scratching my hand up pretty badly. Having a bloody hand at the start of the race wasn’t ideal, but I didn’t want to miss our wave’s start time by trying to find a medical tent. So alas, I dealt with it. And while waiting in the corral for the race to begin, I noticed these ladies to my left. 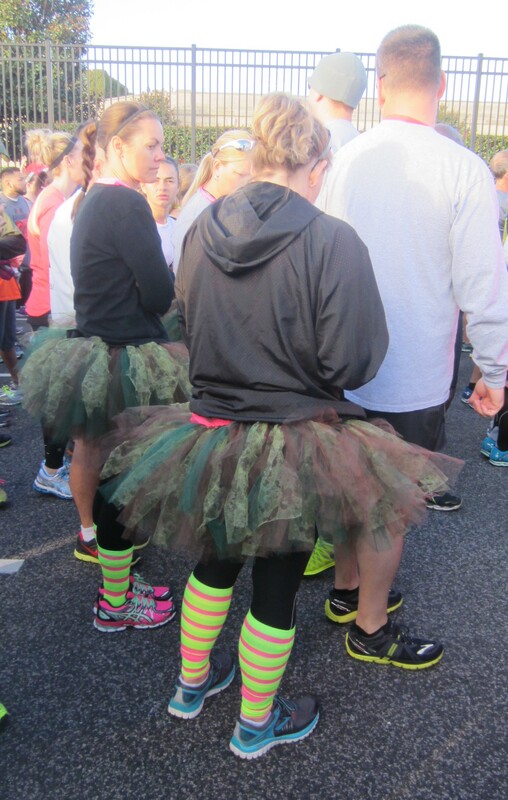 Tutus have their place at races, even at military races. If there’s anything that I’ve learned about the military, its that start things on time. The Wounded Warriors started at 7:50 a.m., followed by the first corral at 8:00. We were in the third corral, which started at the advertised time of 8:16. Each wave was signaled to start with the sound of a canon being shot. I can’t think of a much more patriotic way to start a race. Running through DC never disappoints. 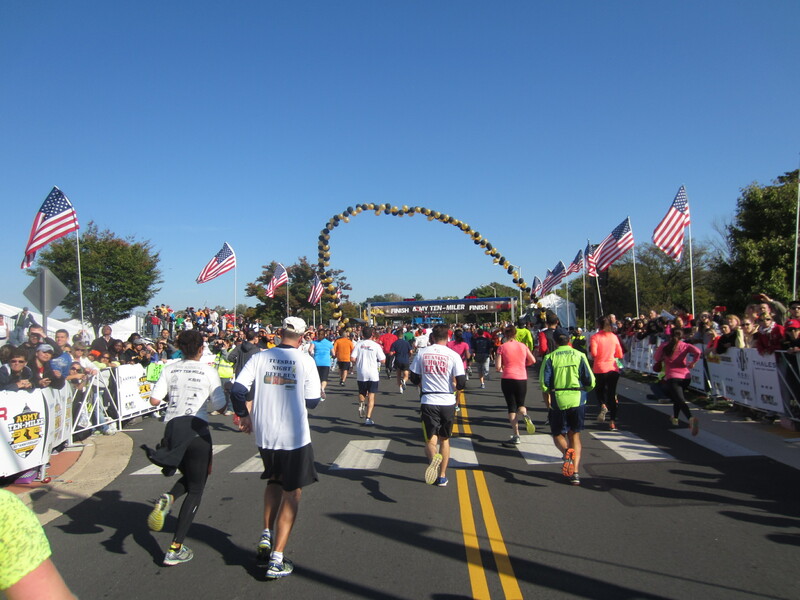 One of the things that I loved about the Army Ten Miler was that we started and ended in Virginia, which gave me a slightly different course experience than what I experienced during Rock ‘n’ Roll USA and the Cherry Blossom Ten Mile Run. Running across Memorial Bridge towards the Lincoln Memorial will never get old. And running along the National Mall is one of those things that I take far too much for granted since we live in this area. This guy was so inspirational. Somehow he had the energy to run and play patriotic music! 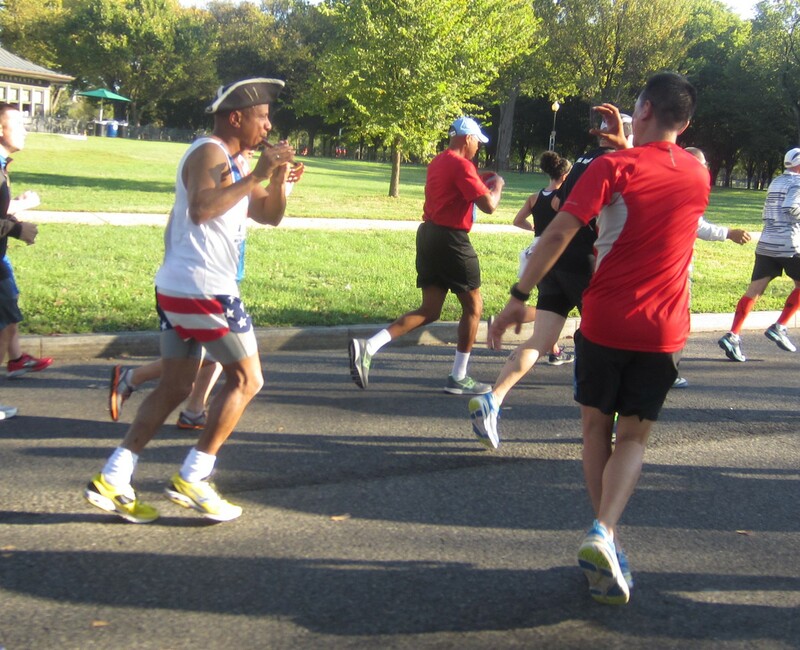 The highlight of the Army Ten Miler course for me was running on Independence Avenue. 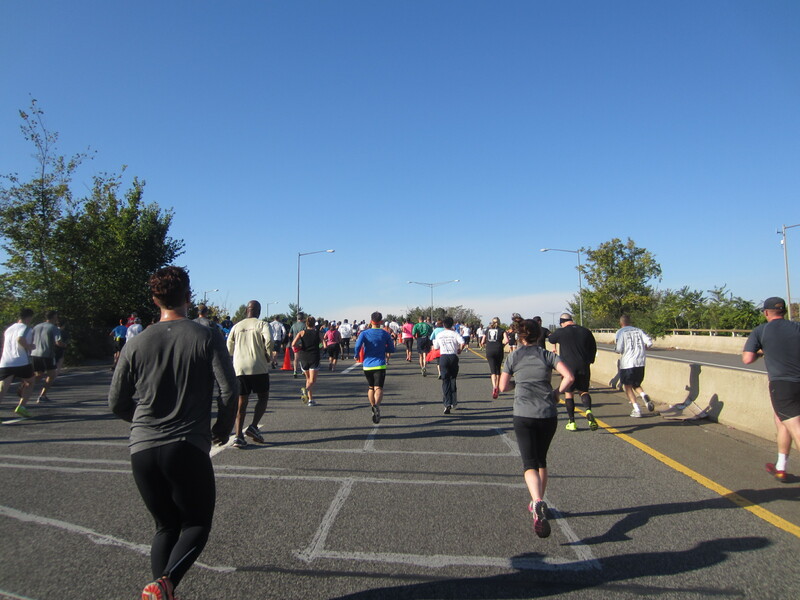 Not only do you cross the halfway point of the course while on the National Mall, but more than a mile of the course doubles back and runners get to encourage one another along the way. Although I had been mentally struggling during the race for the first half, once we hit Independence Avenue the energy of both the fellow runners and the crowd helped me to fight the mental battle that I had been facing. As we turned left off of Independence Avenue onto 14th Street and were headed for the dreaded bridge, I knew that all of the energy that I had been conserving had been for that moment. The energy running along Independence Avenue was absolutely amazing! As we started the first uphill towards the bridge, I kept reminding myself that I had done all I could to prepare for this part of the course. I had put in the adequate time doing hill training, and that all I had to do was put one foot in front of the other. As I looked around me, I saw that others were struggling. But I kept reminding myself that if I maintained my run-walk intervals (I had been doing 2:15 run/0:45 walk up to this point of the race), that I could get across the bridge with enough energy to increase my intervals to 3:15/0:45 once I reached mile 8. 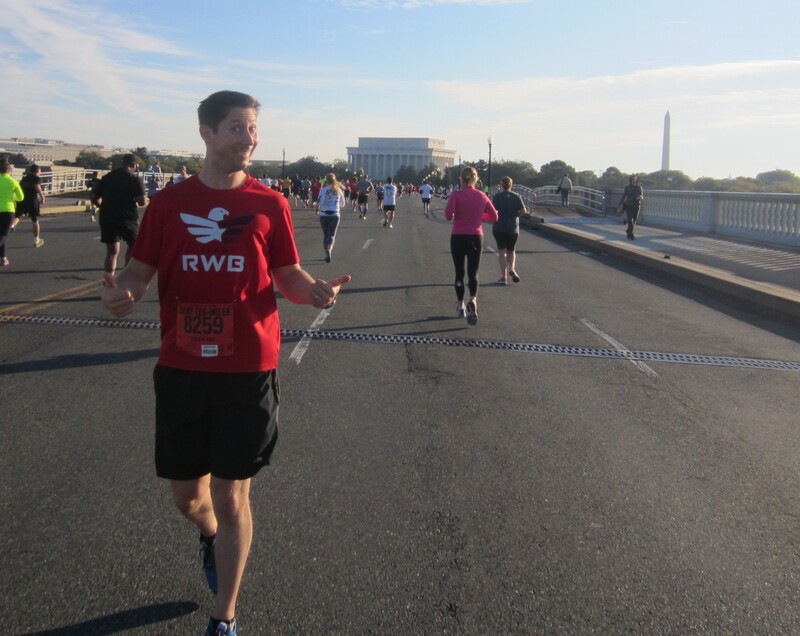 On the bridge, a fellow Team RWB noticed that I was starting to struggle a bit, and passed off a Team RWB wristband to help encourage me to keep at it. I almost felt as though he was giving me power to push forward. And that was the last push I needed to help get myself over the bridge. As we ran off the bridge, I knew that I could PR (which was my B goal), but that it would be close for me to reach my A goal. I gave the race all that I had for those last two miles, and before I knew it we were nearing the finish line. Preston and I crossed hand in hand at 1:53:02, just 48 seconds faster than my A goal finish time. I’m beyond thankful that Preston decided to run the race at my pace instead of at his own. He hasn’t been training much lately, and decided that instead of risking injury that he’d take it easy and run with me. Because this race wound up being more physically and mentally challenging than I anticipated it being, I cannot thank him enough for how much he encouraged me before and throughout the race. My other big encouragement during the race were the many wounded veterans who I saw out on the course. It is beyond inspiring to see these men and women out pushing themselves physically and overcoming the obstacles that they’ve faced that have caused them to loose limbs and face physical limitations. As I passed each one, I kept thinking to myself that if they can do it, so can I. With the encouragement of so many, I had done it. I crossed the finish line of my last major race of 2014. And while there were some cons to this race (I’ll recap the pros and cons in a separate post, as I don’t want that discussion to take away from how meaningful this race was), this is one race that I cannot wait to run again! 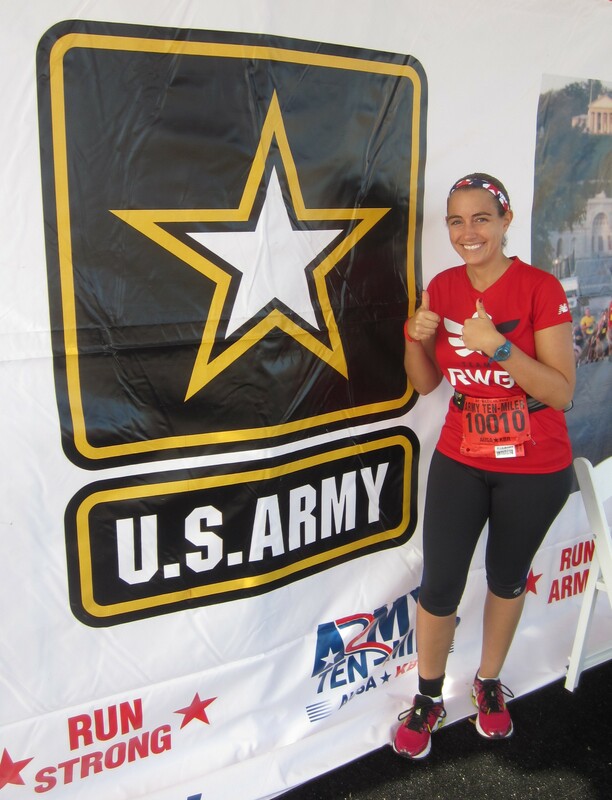 QOTD: Have you ever run the Army Ten Miler? What about any other military races? Don’t forget that today is your last day to enter my Hemp Hearts Giveaway! This entry was posted in Milestones, Races and tagged Army Ten Miler, personal record, run-walk-run method, running, Team Red White and Blue, ten miler. Bookmark the permalink. Great way to end your fall season (of major races) You captured some nice images of the ATM (great one of Preston and the RWB team). I’ve never seen the running flutist – what a treat! I am interested to hear your pros/cons of the race… this one is such a LARGE one. Definitely a large race, which is part of why I decided to review the pros and cons separately. Awesome! Why is that bridge so hard??? If anybody has the secret answer to conquering that bridge, please let me know! This sounds like SUCH an incredible race, and congrats on a great finish! I’d love to do this one someday! It must have been so fun running with Preston; glad you guys had such a great time together! Also? How in the WORLD can you run AND play an instrument?! That’s awesome! The flutist was incredibly talented, and played multiple songs when we were running near him. So amazing! Congratulations Kathryn!!! What a way to end the season! And the course looked amazing! I can’t imagine being able to run by all of those monuments! Its such an incredible experience, Mindy. You’ll have to run a DC race someday! Congrats! What a great way to end your 2014 race season ( with a big race anyway). Do you plan on doing any smaller races this winter? I have two smaller races between now and the end of the year. I’ve heard great things about Run for the Dream. I might have to look into that sometime in the future. I haven’t run in military races but I know people who have done the MCM races, or will be doing them this weekend. You should definitely try to run one of them someday. It sounds like such an emotional race. I did the Semper Fi 5k earlier this year but that’s the only military race I’ve done. Congrats on the great time and pushing through! That’s so hard to believe! Congrats on a fabulous race and meeting your A goal. You have done so well this year Kathryn, improving at almost every race. This sounds like the perfect way to end your big racing season. Hopefully you will be doing a Thanksgiving turkey trot and a jingle bell run too! Hope I see you this weekend! Thanks Pam! I’m planning on doing both a Turkey Trot and the Christmas Town Dash in Williamsburg. Hopefully I’ll see you on the course this weekend! so cool! Sounds like quite an awesome experience. Congrats on the great time! congrats on meeting your A goal-great job! 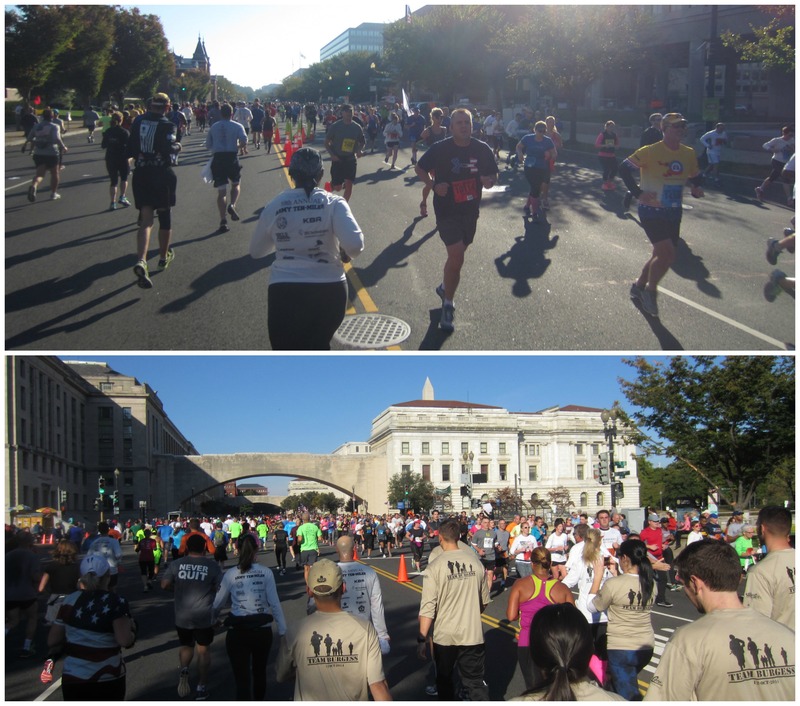 and I am obsessed with all of the race recaps from the DC races-they all look amazing! I feel like our races in LA are a bit boring 😦 I think I need to try and get out there to run one ASAP! You’d love running in DC! There are so many great races to choose from! Way to go Eagle!! Team RWB member here from Cincinnati, OH!